Two Russian cosmonauts and a NASA astronaut strapped into a Soyuz ferry craft, undocked from the International Space Station and plunged back to Earth Wednesday, settling to a jarring rocket-assisted landing on the steppe of Kazakhstan to close out a 169-day mission. With commander Alexander Skvortsov at the controls, flanked on the left by flight engineer Oleg Artemyev and on the right by outgoing space station commander Steven Swanson, the Soyuz TMA-12M descent module landed on target near the town of Dzhezkazgan at 10:23 p.m. (8:23 a.m. Thursday local time). The final minutes of the return to Earth were seen on live television provided by recovery crews near the landing zone, showing the capsule descending through a cloudless, slightly hazy sky under a big orange-and-white parachute. The descent module landed just out of view over the horizon, its solid-fuel "soft landing" rockets kicking up billowing clouds of dust as they ignited an instant before touchdown. "Touchdown confirmed," said NASA mission control commentator Rob Navias at the Johnson Space Center in Houston. "Touchdown right on the button ... on the steppe of Kazakhstan. 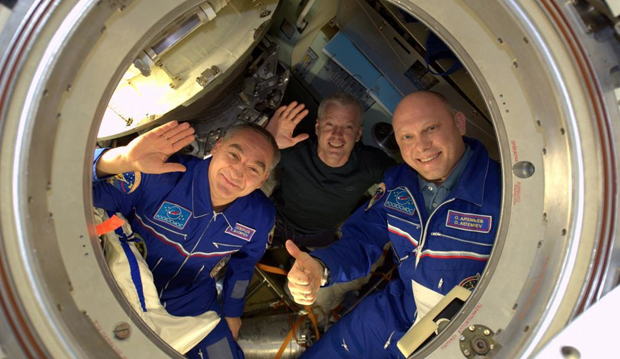 The Expedition 40 crew -- Steve Swanson of NASA and Russian cosmonauts Alexander Skvortsov and Oleg Artemyev -- are home, back on Earth after 169 days in space." As usual, Russian technicians, flight surgeons and a contingent of NASA support personnel were standing by near the landing site to help the returning station fliers out of the cramped Soyuz capsule after five-and-a-half months in the weightlessness of low-Earth orbit. 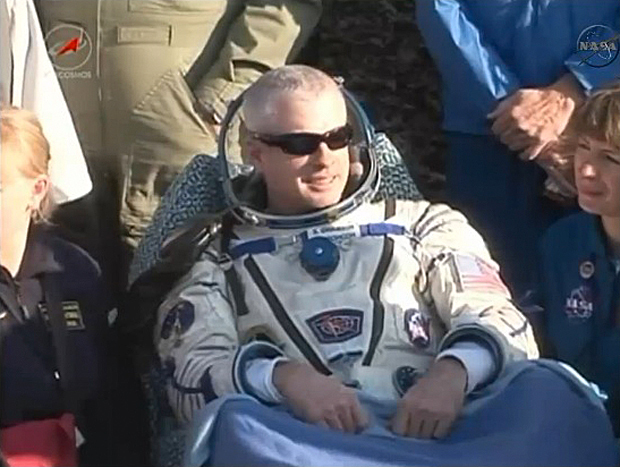 Skvortsov was first out, carried to a recliner set up near the charred descent module. Swanson was next, followed by Artemyev. All three men appeared comfortable and in good spirits as technicians carried out initial medical checks, enjoying fresh apples as they chatted with support crews. After brief satellite phone calls to friends and family, all three were carried to a medical tent for more detailed exams before boarding helicopters for a flight to nearby Karaganda where Kazakh officials planned a welcome home ceremony. After that, the crew was expected to split up, with Skvortsov and Artemyev heading on to the cosmonaut training center at Star City near Moscow while Swanson boards a NASA jet for the long flight back to Houston and the Johnson Space Center. The descent to Earth began in earnest at 7:01 p.m. when the Soyuz TMA-12M spacecraft disengaged the docking mechanism of the station's upper Poisk module as the lab complex sailed 260 miles above eastern Mongolia. 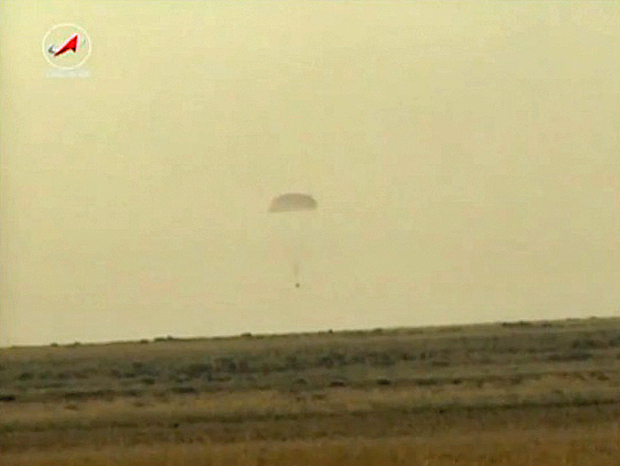 "Goodbye, station," Skvortsov said as the Soyuz departed. After moving a safe distance away, Skvortsov and Artemyev monitored an automated four-minute 40-second firing of the Soyuz spacecraft's braking rockets starting at 9:31 p.m., slowing the ship by about 286 mph and setting up a steep plunge back into the atmosphere. After a half-hour freefall, the Soyuz's upper habitation module and lower propulsion module separated and the central crew compartment plunged into the discernible atmosphere at an altitude of 62 miles. The capsule's main parachute deployed around 10:10 p.m., at an altitude of about six-and-a-half miles, and the spacecraft settled to a rocket-assisted landing about 13 minutes later. "It takes only three hours and 20 minutes from the time I undock from the International Space Station until the time I'm on the ground in Kazakhstan," Swanson told a reporter Monday. "I've heard it's quite an eventful trip. I haven't experienced it yet myself, but from what I've been told it's definitely the big ride at Disney World." No word yet on whether the ride matched his expectations. On Tuesday, Swanson turned over command of the space station to veteran Russian cosmonaut Maxim Suraev. Floating in the Japanese Kibo module, Swanson said "We've accomplished a lot, we've had a lot of fun. Hopefully everybody else had a lot of fun, too." "We did lots of cargo, we did lots of science," Swanson said. "We actually set the record for the number of hours of science in a week. We did a lot of maintenance, which is good and bad -- I love doing maintenance, but it means things broke. We had a good time, we really appreciate everybody's help up here." Suraev then took over as commander of Expedition 41, promising that he and his crewmates -- Reid Wiseman and European Space Agency astronaut Alexander Gerst -- would "do our best to continue this great work." Suraev, Gerst and Wiseman will have the space station to themselves until Sept. 25 when three fresh crew members are scheduled to arrive: Soyuz TMA-14M commander Alexander Samokutyaev, NASA astronaut Barry "Butch" Wilmore and Russian flight engineer Elena Serova, the first female cosmonaut to make a long-duration stay aboard the station. "We're super excited," Wiseman told a reporter earlier this week. "Getting three new faces up here will be a lot of fun." Skvortsov, Artemyev and Swanson were launched from the Baikonur Cosmodrome in Kazakhstan on March 25. The crew was unable to execute a four-orbit rendezvous with the station as planned because of a slight orientation error. But after analyzing telemetry, Russian flight controllers cleared the crew for a two-day rendezvous and the spacecraft reached the station on March 27 without any additional problems. During the course of their stay in space, Swanson and Expedition 39 astronaut Rick Mastracchio ventured outside the station to replace a balky computer while Skvortsov and Artemyev staged a pair of Russian excursions. The crew also received and unloaded a variety of Russian, European and American cargo ships and carried out a full slate of scientific research with more than 170 experiments. Swanson and his crewmates took off as superpower tensions were building in the wake of Russia's annexation of Crimea and the escalating conflict in Ukraine. Before launch Swanson said he was confident the International Space Station would remain a cooperative U.S.-Russian project, saying space engineers and managers on both sides of the project continued to work well together with no hints of friction. "We are learning many things but I think one of the important things we are learning is how to work with international partners," he said in a NASA interview. "That is a huge key and is not always that easy, but we are doing a very good job of it. It starts with the program levels and goes all the way, working down to the lowest engineers. They all have to work together to make this thing work. "And then, how to build something this large in space, with multiple trips going up, and putting it all together, that is not easy either. It is an engineering marvel just that the thing works, and so I think that we have learned so much in that aspect." Living and working aboard the space station also will pay off down the road, Swanson said, with knowledge directly applicable to eventual long-duration flights to Mars. "How to live there, how to replace and repair everything, how to keep things running, how to keep things clean, all these aspects about just living in space and keeping a good environment going over a long, long period of time," he said. "We have been aboard over ten years now and have kept it running. What we have really learned, I think, is how to operate in space and make that a nominal, easy way of doing things." At landing on the steppe of Kazakhstan, Skvortsov, Swanson and first-time flier Artemyev will have logged 169 days five hours and six minutes off the planet, completing 2,704 orbits covering 71.7 million miles. Including a 176-day station flight in 2010, Skvortsov's total time in space will stand at 345.3 days. Swanson's total, including 27 days aloft during shuttle missions in 2007 and 2009, will move up to 195.9 days.